Your welcome szn! Welcome to the blogoshpere! Rhett: it was lots of fun. 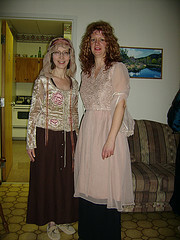 The best part was scouting out the costumers from the Goodwill store in Humboldt–it was most fun dressing up. i had a little pang looking at the pictures, but i know i’m where i’m supposed to be right now: at home. glad you’re all having fun! is anyone watching the young and the restless? kimmy: We’ve had many pangs without you! We’ve also had much fun. This year we had the Mardi Gras/Medieval Feast, and Oscar night (I picked up a great fake Pucci for .25 cents at the Goodwill). i’m saving my buttons for next year, dears. We hope you are kimmy!